For some reason a raging wildfire ripped through the Valleyford Cemetery, but did not burn the flags. Less than an hour prior my husband, 5-year-old daughter and I were traveling back from Rathdrum to rehome a cat that had belonged to his father who passed away the week before. The city of Rathdrum, ID sits a little over 30 miles northeast of the tiny town of Valleyford. The quaint town stretches across 12 miles of mostly farmland and hosts a little over 1,000 residents of mostly farmers, small producers, and country folk. For reference sake, let me say that I stand with one foot on either side of small producer and weird country bumpkin. Valleyford sits just southeast of Spokane, Wash. and just south of Spokane Valley, Wash. about 10 miles. This apple tree that sits just north of Stoughton shows where the fire jumped the road and had it not been for diligent farmers and firefighters could have moved north and destroyed several homes. Driving back from Rathdrum, I could see my husband still wore that deep sad look that can only come from a combination of grief, shock, and a still-recent painful event. I hung up the phone and looked out the driver’s window. I could see a plume of smoke in the horizon southwest of me. “This couldn’t be headed towards my house? My husband’s dad just died. My luck couldn’t be that bad,” I thought. When we pulled into my driveway, we could see the cloud of smoke blanket the sky. My surroundings grew dark and looked like evening time although it wasn’t even 4 p.m. My husband let us out then hopped back into the car, “I want to go see where the fire is,” he said then abruptly left. I nodded then proceeded to follow my usual routine of going inside to let the dogs out while my 5-year-old investigated for eggs in the chicken coop. My view from the ravine where we evacuated. The sky became darker and the cloud of smoke grew larger. A mixture of shock between the recent loss of a family member and this current crisis, I followed my routine. I let my dogs out and went out into the backyard to check my garden for any newly ripened vegetables. Finally though, the sound of fire shook me out of my calm confused state. I come from a long line of strong women. Some were logger wives, farm wives, or like me the daughter of a hard-as-nails nurse who spent 40 years serving sick people at Sacred Heart Medical Center in Spokane. I wouldn’t know how to wring my hands and bawl if someone showed me. Whether this pole was replaced after the windstorm in 2015 or the recent fire, it does show how destructive fire can be. The week prior when I got the call that my father-in-law was at the CICU or Cardiac Intensive Care Unit I hung up and jumped in my vehicle and headed straight to the hospital that has been such an important part of my life. Born there, fed there, raised by one of the employees of this facility; I knew I was about to see someone take their last breath there. The last text read that they had performed CPR on my father-in-law for the third time. The daughter of a nurse and a professional rescuer myself, I knew things were not looking good. Sitting across from my husband in the waiting room that only an hour before held a dozen or more people praying for a miracle, the news came that he was gone and I could see the look of anger and sadness switch to that of love then back to anger. Suddenly I recalled one time asking my dedicated nurse mother if she ever saw someone die. “Yes,” she replied. “What do you do when someone dies?” I said with the innocence of a curious child. “You just accept it and do your job,” she stated. There I was across from my husband looking into his shocked brown eyes that flickered between emotions. I could feel the strong women I am descended from standing behind me and telling me that I needed to accept this moment and go to work because my husband couldn’t right now. One of the houses that burnt down. Side-by-side my ancestors, I imagined the Sisters of Providence who founded SHMC and worked and managed the hospital for much of my mother’s time there, holding my grandmother’s and great-grandmother’s hands as they encouraged me to go forth and help my grief-stricken husband. The next week and the week before the Yale Road Fire my focus became my husband and laying to rest his father who died unexpectedly. Normally during this time of the year I’m hyperaware about the potential for wildfire. I pay attention to the winds, make a green barrier around my house, and remove flammable debris. This past week though had been spent making funeral plans. This Sunday, Aug. 21 the day after the funeral for my husband’s father, was supposed to be a recovery day. Quiet and calm as we found a place for his pets and sank back into our country home before figuring out how to do life with one less person in the world who loved us, we drove home. Less than an hour later life was anything but calm. I heard the wildfire closing in. It sounded like a combination of the put put of an old engine and the slow banging of a timpani drum. Going vroom vroom, I could hear the fire approaching. “Yes Tammy we are evacuating,” someone replied. I turned around to gather a few things, my daughter and went to get in my car and realized my car wasn’t here. We had left our other vehicle at my husband’s brother’s and my car was now being used by my husband to investigate the fire. One of many signs created by thankful citizens of Valleyford. While I waited for him to return I went inside to grab a few clothes and toiletries. On the way out I managed to grab my out-of-print copy of Warrior of the Mist: A Biography of Qualchan Chief Owhi’s Son. The book tells of the great Yakama warrior Qualchan and his fight against the white settlers and Colonel George Wright in the 19th century. He died in September of 1858 by hanging. This incident took place very close to my home and I grew up next to what is called the Hangman Valley. Being that Qualchan died so near my house has always caused me to have an intense interest with the fallen warrior. It took me months to find this book. I didn’t want to lose it. Now the Hangman Valley near Valleyford named after the way he died vs. who he was, currently sprouted flames and made the haunting sound that is wildfire. My husband returned and we got the dogs and climbed in and took off leaving behind the cats and the chickens. Now on the road north of the ravine at the bottom of my property I stood jumbling my words while trying to tell someone about the wildfire. 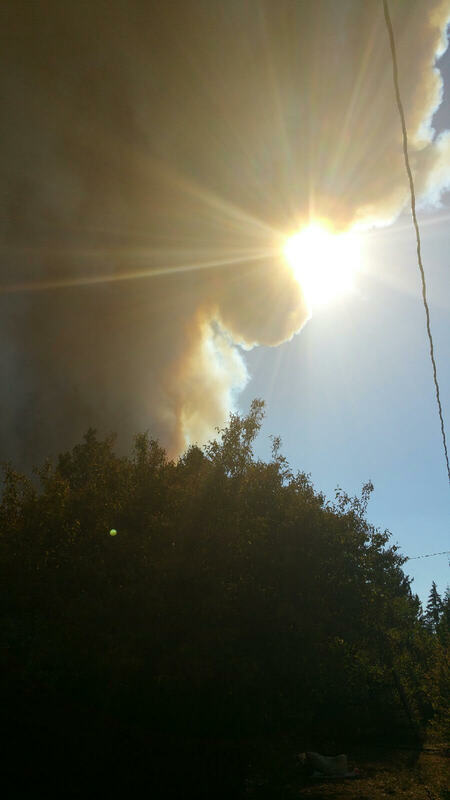 This was what I saw from my house the day the fire started. My neighbors and I all looked towards our houses now backlit by plumes of smoke. The flames approached and I thought that this was it. My house would soon be rubble. My 5-year-old sat in the back seat and because I hadn’t yet figured out how to get the child locks on, kept opening it and saying she wanted to stand near her mama. I kept telling her no and finally walked to the car to keep her from opening the door. I looked ahead at the gravel road that stretched in front of me and saw a large combine coming my direction. Acclimating to rural life in Valleyford includes navigating around combines. During the parts of the year the combines are out plowing the fields, I plan on an extra 15 minutes into town in case I get stuck behind a tractor. This time was different. Although still somewhat slow, I could tell this giant farm machine was running at full speed and in a hurry. I yelled at my daughter that she better not open the door. Thankfully she listened as I ducked behind the car just in time to get out of the way of the large metal spirals that went right past my head. The farmers worked side-by-side the firefighters making plow lines, putting fires out with shovels and axes. Able townspeople went to the many small farms that spot the countryside to help load up horses, pigs and sheep in trailers to evacuate. Despite saving efforts, many were not so lucky as to get their livestock out. One family lost 400 head of sheep. 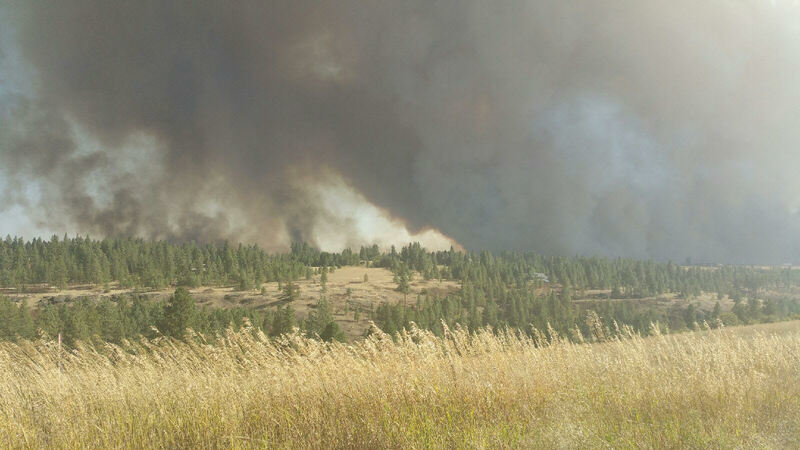 More than 6,800 acres caught fire in what is now referred to as the Yale Road Fire. A broken branch colliding with a power line is what sparked the great blaze that consumed much of Rock Canyon and Qualchan’s Hangman Valley. The fire started in Spangle and moved so fast it spread quickly into Valleyford and went all the way up to Stoughton Rd. threatening many homes and farms in the area. Ten homes were lost in the fire. It spread so quickly that many didn’t have time to get anything out of their house and were left with nothing. We were Level 3 evacuated twice. Level 3 evacuation means “Get out now!” The second Level 3 evacuation came the next day when the canyon behind my house caught fire. During the second evacuation we managed to get our cat and baby chickens along with our dogs and take them to the fairgrounds where emergency shelter had been set up for animals impacted by the fire. On the Sunday the fire began, when my husband finally convinced me to leave the ravine facing my house, returning to the vehicle I got in wearing the same face he had been wearing the last week. While nothing can replace the loss of a family member, the fear that I was about to lose my childhood home- the one that my dad spent 40 years of his life building on, welding, caretaking-sank into my soul. Driving away from the fire that somehow steered away from my home and was now just east, I thought about what it meant to be strong in the face of disaster. I thought about the combines I saw heading into the fire. I looked up at the sky and saw a group of small planes headed toward the flames. We came up with the idea to go back to our house and try and get more belongings. Headed down Stoughton, just before the small forest that signaled we were almost home, I witnessed a plane dump fire retardant on a field I normally see on my morning runs as the home of a couple horses that spend most days gnawing on grass and meandering around in. Now the horses were no-where in sight and the field of mostly alfalfa now grew smoke and flames. The Valleyford Cemetery after the fire. My husband turned us around and dropped us off at the Valleyford Church, said he was headed back and pulled out of the driveway. Standing at the church with a group of stunned onlookers the large 747 aerial fire fighter planes flew above me in the skies and toward the giant fire. The street of Madison, the main strip, normally quiet now ran like a freeway as trucks with horse trailers and boats attached moved out of the fire zone. I lived through the Hangman Fire of 1987. I remember the canyon burning. Like the Yale Road Fire, homes were lost. This fire somehow seemed different. Maybe because I wore the innocent goggles of childhood and I was now experiencing wildfire as an adult, I still have never seen a fire come so close to my town. This time I saw what is referred to as a fire tornado. It's as horrible as it sounds. The most evil destructive natural thing I have ever witnessed. Although strong on the outside, during this time I was very aware that if I didn’t watch myself it could very easily be me in the Emergency Room. I have a disease called Cyclic Vomiting Syndrome. There is very little information on this disease, but they do know that stress can trigger an episode. I spent weeks barely sleeping, not watching my diet (except for no wheat or lentils), and not taking my enzymes (Co-Q10, L-Carnitine, Creatine). For me, that’s a recipe for an Emergency Room visit. Thankfully I have people in my life who care enough to call. Care enough to call and ask me if I was taking care of myself during this stressful time. I can’t thank you enough friends and family. Perhaps you don’t know it, but you saved me from the trouble an Emergency Room visit and being knocked off my feet brings. They say what doesn’t kill you makes you stronger. I now know that the tough women that came before me are right there standing behind me keeping me strong. I also know that I live in a community that when faced with adversity come together. I told my panicked daughter, traumatized by the possibility that she may lose her home, that we live in a world of helpers and superheroes; many in the shape of firefighters that are here to protect us from the devastation that is wildfire. This quieted her non-stop distraught crying. To my awe, I also now know that in my community, that farmers don’t simply work 12-16 hour days to keep us fed. When disaster strikes, they are and were willing to jump into the flames to save all of us from devastation. I know many of the farmers out here are third and fourth generation. I imagine that when this fire struck, the brave farmers-no longer here but in spirit-stood behind them as they worked to put out the flames. During this historic fire, we were firefighter strong and farmer strong.